This method is low risk, inexpensive, and makes a great starting point for transitioning to private label. 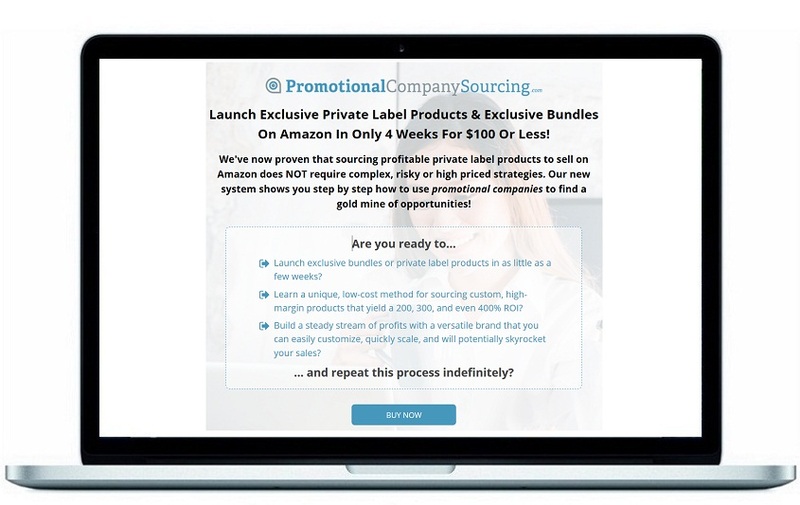 Launch exclusive bundles or private label products in as little as a few weeks? Learn a unique, low-cost method for sourcing custom, high-margin products that yield a 200, 300, and even 400% ROI? Build a steady stream of profits with a versatile brand that you can easily customize, quickly scale, and will potentially skyrocket your sales? … and repeat this process indefinitely? Q. Do I need to incorporate or have a business address to work with promotional companies? A. No! Unlike most wholesale companies, promotional companies don’t require you to be a business in order to purchase and customize their products. Q. Will I need to ask permission to sell promotional company products? A. No! Once you’ve customized your product, promotional companies are not concerned with the product positioning once it leaves their warehouse. Q. What if I don’t live in the U.S. – is this still for me? A. Where you live doesn’t matter! There are simple and creative options available for all! Several of our most successful students are outside the U.S.
Q. Do you need a lot of capital to follow this model? A. While you do need some money to order inventory from promotional companies, most will allow you to purchase small orders. Christi Michelle, the lead instructor in this course has over 6 years of experience working with promotional companies and is a leading private label expert. She will systematically show you how to uncover countless promo company opportunities the same way she’s done time and time again. Christi’s program inspired me to completely revamp my product line with fun, simple to create products. Her great examples got my creative juices flowing and totally spoke to me. Her course was the first course in ages to really bring back the excitement to PL! It’s simple, it’s easy, and most of all it’s fun. I have 3 new products at AZ and 4 more in production. I took her course and started working on new products immediately! Note: This is the training videos only version.